The 2019 $0 down, VA home loan limit for Cassia County is $484,350. Cassia County was officially created on February 20, 1879, by the Idaho State Legislature from a portion of Owyhee County. Located on the southern edge of Idaho, Cassia County is home to several nationally protected areas. The county was named after the Cassia Creek. Encompassing 2,580 square miles of land, 2,565 square miles of which is land, and 15 square miles of which is water, Cassia County is a great place for outdoor activities. The total population of Cassia County is 23,540, including a veteran population of 1,340. The City of Rocks National Preserve is one of the most popular tourist destinations in Cassia County. The preserve contains many rock spires and other rock formations, making for excellent rock climbing opportunities. City of Rocks is rich in history and was once the main hunting grounds for the Shoshone and Bannock Native American Tribes. A multitude of diverse animal species makes their home in the City of Rocks, including mule deer, cliff chipmunk, leopard frog, red-tailed hawk, and many more! Another nationally protected area in Cassia County is the Minidoka National Wildlife Refuge. The Wildlife Refuge is made up of Idaho plains, wetlands, and open water, making it one of the best places to see the Idaho landscape. Many nesting birds, small mammals, and reptiles make their home in the Minidoka National Wildlife Refuge. Several endangered animals can also be found in the Wildlife Refuge. The Minidoka National Wildlife Refuge is the perfect place to explore nature, or to just relax by Lake Walcott. The Snake River partly flows through Cassia County. For the best boating and canoeing activities, be sure to visit the Snake River. The river is home to a diversity of fish species, making it an excellent location for avid fishers. Camping is a popular activity along the shores of the Snake River. For a day out with family or friends, be sure to take advantage of one of the many picnic areas. The Cassia County Fair and Rodeo is an annual event in Cassia County that lasts five days. Delicious food vendors and fun games and rides can all be found at the Cassia County Fair and Rodeo. The main event is an exciting rodeo that features some of the best riders in Idaho. Other events at the fair include musical acts, horse and dog shows, and a dairy showing. The Cassia County Fair and Rodeo takes place every summer. The Minidoka County Veterans Office, a Disabled American Veterans Office, and many other veteran resources can all be found near Cassia County. The median housing cost is $125,900, including a veteran population of $42,039. Let VA Home Loan Centers help you complete a VA loan application today! 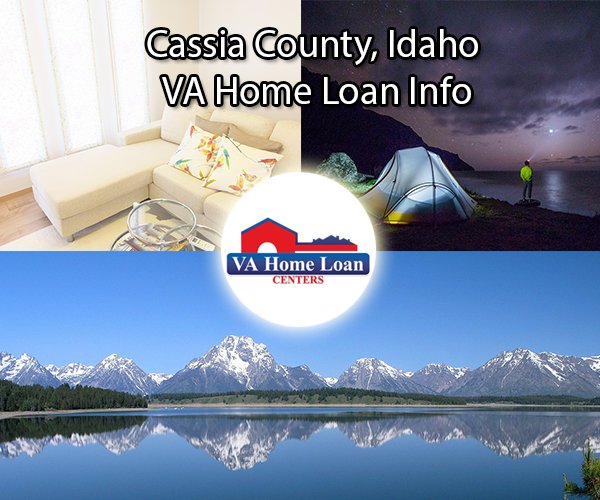 For an updated list of VA-approved properties in Cassia County, call VA Home Loan Centers at 888-573-4496. There do not appear to be any approved condos located in Cassia County. Click here to find out how to get your condo approved.